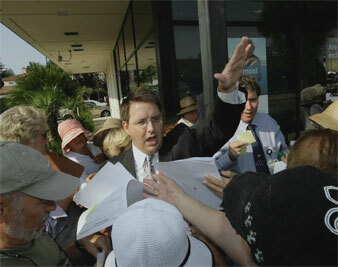 America is shaken by images of panicked customers lined up to withdraw money from the failed IndyMac Bank. For the past two days, America has been shaken by photos and video reports of angry customers lined up to withdraw their money from branch offices of the failed IndyMac bank. Such images would not have been seen during America’s last great financial disaster. Comb the microfilm records of newspapers in 1931 and 1932, when depositor panics closed most of the banks in the United States, and you will not find a picture of terrified depositors lining up in hopes of extricating their life savings. Their absence stemmed from editors’ fear that the publicity would intensify the panic. Today, editors exercise no such restraint–and with the Internet, who needs editors? Media images of panicked Americans may have depressed Federal Reserve Chairman Ben Bernanke. But more depressing, after his repeated efforts, including the throat-slitting of Bear Stearns, must be knowing that he has failed. Stockholders in banks and kindred financial institutions are in such a panic state, they cannot get rid of their investments fast enough. But as they dump their holdings, the price tanks faster than they sell. In the space of a year, Citigroup, once considered America’s largest bank and now the world’s largest mess, has seen the price of a share of its stock fall from almost $53 to less than $14. Most of that happened before Treasury Secretary Henry Paulson popped up in front of a replica of the Liberty Bell on a Sunday afternoon to announce his plan to save, bolster, prop up, rescue, bail out or pick-your-verb Fannie Mae and Freddie Mac. In the years before Paulson’s plan, Bernanke had moved hell and high water to stop the implacable slide of real estate prices, but he has not been able to do it. He loaned money, he pumped money, he swapped money for unsellable bonds. In every imaginable way he forced money into the imploding system, and to no avail; the price of real estate keeps dropping. Bonds, derivatives and all the other financial arcana have lost value to the point that nobody knows what anything is worth anymore. The superstructure of what is now only ironically called high finance is melting and swaying. The announcement of the Paulson plan, meant to soothe and reassure, has had no such effect. If anything, in the days after his announcement the contagion has spread. Instead of the stock market perking up and the mortgage world calming down, there were predictions that we will shortly see as many as 150 banks fail. “There is widespread speculation and rumors in the markets today,” said a beleaguered spokesperson for Cleveland’s National City Bank, adding plaintively, “Look, we are not experiencing any unusual depositor or creditor activity today.” The Securities and Exchange Commission, which has distinguished itself through the months of this developing disaster by doing nothing, told the world it would be going after anyone spreading “false” rumors driving down the price of securities. True rumors are apparently OK. While the Securities and Exchange Commission was swatting flies, Chairman Bernanke turned up on Capitol Hill today to tell Congress that he was one confused man. That was the gist of a presentation in which he was able to do little more than point out the dangers of a collapsing economy and growing inflation. As he was speaking, General Motors was telling its employees and its stockholders that more layoffs, huge salary cuts and no more dividends were in their immediate future. At the same time the dollar drank the shrinking potion from Alice in Wonderland and set a new record for weakness against the euro. The American economy has not been in such serious trouble in seventy-five years. You cannot expect government officials to say that, however. Commerce, like religion, depends on faith. That Paulson would present a plan that contradicts everything he has stood for as a businessman and a Republican demonstrates what he actually thinks. Things are going to get worse, and people know it. Panic, fear and worry about jobs, savings, debts and bills are on the minds of millions. Unemployment will grow, incomes will continue to shrink and prices grow higher as more companies head for bankruptcy court. The Paulson plan, like the Bernanke plans that preceded it, is not tough enough, not close enough to the bone to make a telling difference. His is a temporizing attempt to prop up the unproppable. There is too much rot in these financial institutions. They will have to be allowed to fail and be reorganized in the process of which a lot of people will, in Wall Street parlance, take a major haircut.